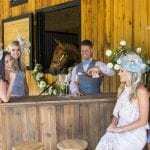 Rooftop venues have long been popular in cities such as Charleston and New York—places where space is often at a premium and must be maximized. However, while necessity may be touted as the mother of invention, it need not be present for one to enjoy the fruits of its labor. Space in Arkansas’ capital city runs rampant in comparison; however, the view is one that, in opinion, may only be fully appreciated from a perch. 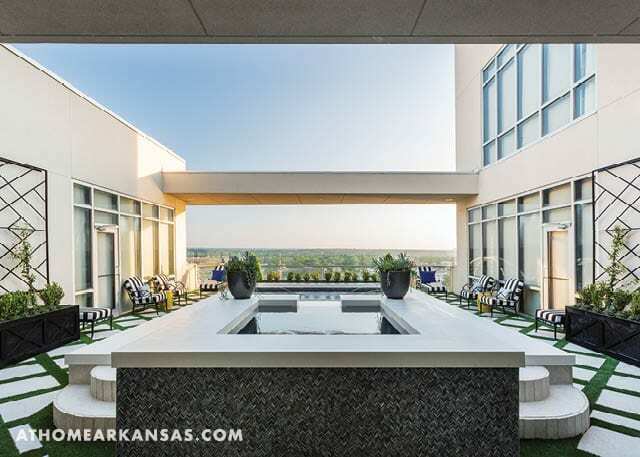 The owners of this Little Rock condo recognized this and decided to cultivate an exterior space that would allow them to enjoy the skyline, as well as each other’s company. 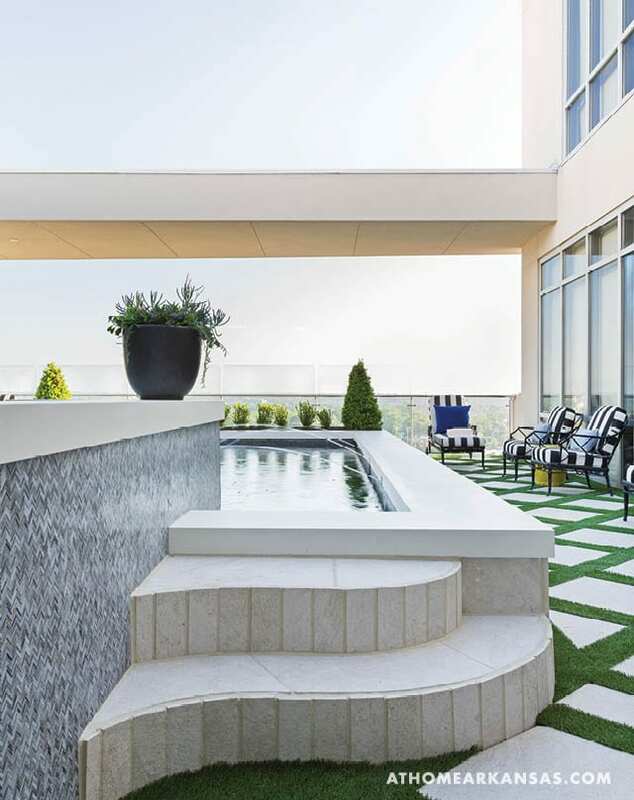 With the help of three local experts, here’s how they created a rooftop oasis in the heart of downtown. In regard to the pool, the directive was to refresh the top surround to give it a sleek and clean look. The same Atlas Concord pavers used for the floor were employed along the sides of the pool for a streamlined feel. Tiles were cut at a radius along the entry steps to add flair. 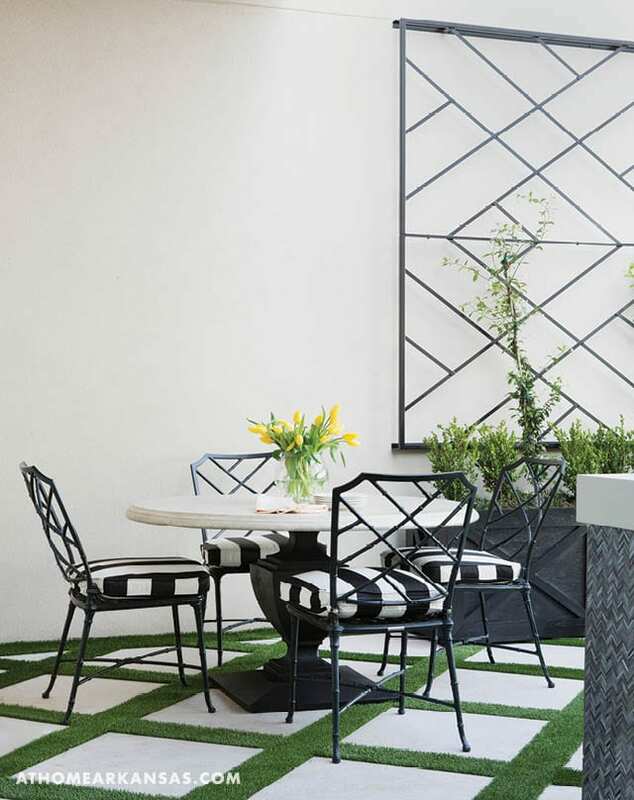 The repetition of this one material, along with the existing charcoal herringbone pattern seen on the base, allows the surroundings to become the focus. “It’s so important to consider the view when you’re working on a rooftop project. 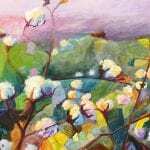 You really want to step back and see how everything looks in the environment,” Munsey adds. 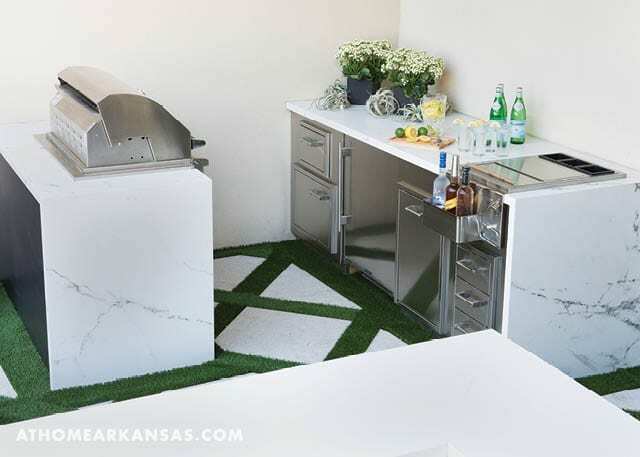 Designer Tobi Fairley, who worked with the family on their home’s interiors, helped to make selections for the outdoor kitchen and furnishings. The kitchen features a grill, refrigerator and bar area, along with a workspace for prepping cocktails or dinner. 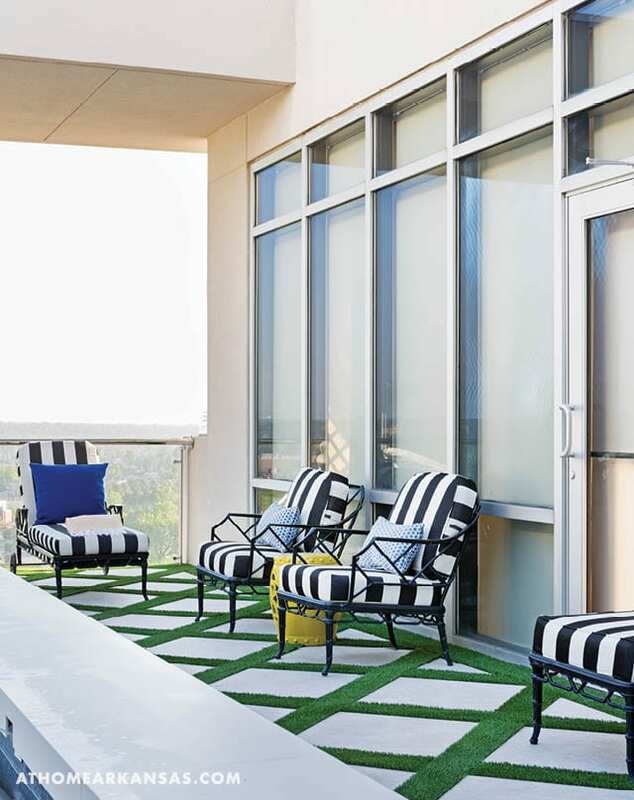 “The furniture for the exterior is an extension of their chic and sophisticated style,” Fairley says. 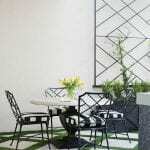 “The homeowner and I were both fans of the always classic Chinese Chippendale fretwork pattern on the seating, and the black-and-white-striped fabric is the perfect combination of bold and timeless; plus, it is a continuation of a striped floor pattern in the entry of the home. I always love bringing the indoors out so that the exterior space feels much like a real room inside the home,” she says. 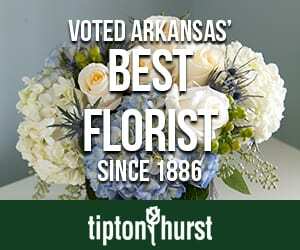 Chris Olsen of Botanica Gardens designed a variety of plantings to complement each of the aforementioned elements. 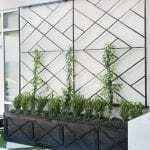 Trellises, which were inspired by the fretwork on the furnishings, line the wall space, adding both dimension and texture. 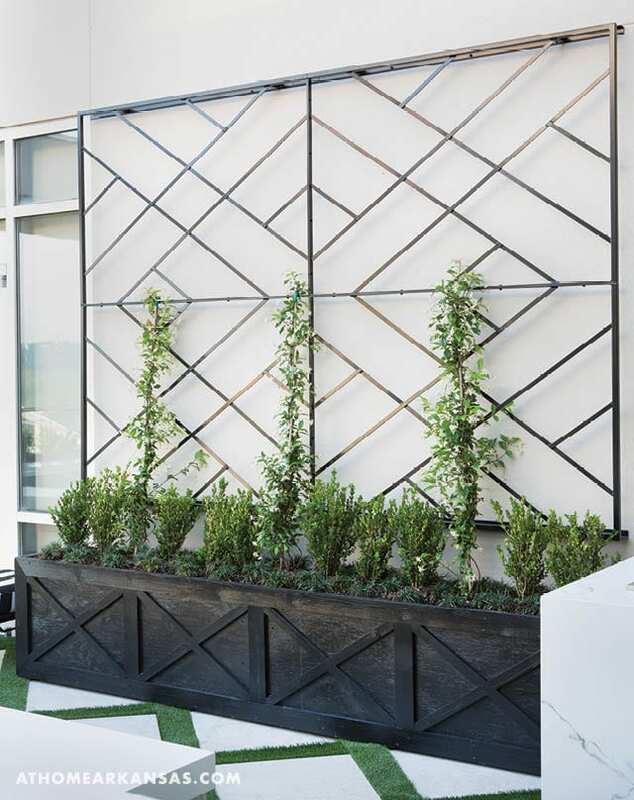 Both the iron trellises, which were made by Accent Iron in Benton, and the actual containers had to be able to travel via elevator to the rooftop—a consideration that both Olsen and Munsey had to take into account for all parts of the project. 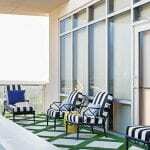 Thus, they were designed and built to travel to the penthouse and be assembled onsite. Heat and wind were top considerations for Olsen as he selected plantings. 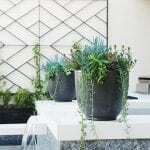 White Confederate jasmine, an evergreen with a sweet scent, climbs the trellises and will continue to offer color and cover the expanse of the structure in years to come. Wintergreen boxwoods and dwarf mondo grass fill the planters for what Olsen describes as a “clean and elegant” approach. 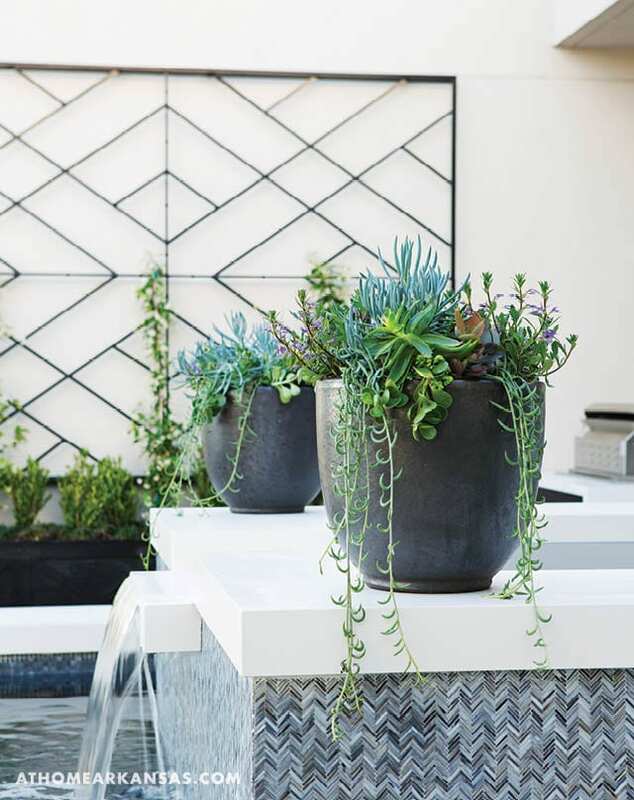 At the pool’s edge, charcoal black planters hold succulents and blue scaevola, heat-tolerant options that will not drop into the pool. “There are really endless options to what we can do with these,” Olsen says of the containers. The same may also be said for the number of ways in which one can enjoy this refreshing oasis.